A lone Joshua Tree and typical sandstone rocks in the background illuminated by soft morning light in Joshua Tree National Park. 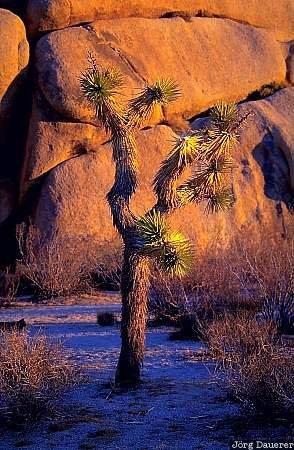 Joshua Trees National Park is in the Mojave Desert in southern California in the west of the United States. This photo was taken in the early morning of a hot day in October of 2002.